A teleconference is a virtual meeting held over a land landline or mobile phone between a host and any number of participants in various locations. Hosting a teleconference easy. All you need is a set of conferencing codes, a telephone and meeting participants. a list of local and international toll free and local captial dial-in numbers that you and your guests can use to dial in to conference from anywhere in the world. To host a teleconference, just use the dial-in number relevant to your location, enter the host code and you are away! Your guests will then follow the same process by joining the conference using the guest code you provide. Once everyone is connected, you can conduct your meeting as you normally would if you and your participants were physically in the same room. Can you still conference when out of the office? Yes. You are not restricted to using a desk phone with our conference call service. Eureka's mobile app - eurekaLINK supports those who need to meet and connect while they are on the move. In addition to this, you do not have to book a time to host a teleconference. As long as your participants know when they need to be on the line, you can dial in at any time. We also offer a dial-out service, which enables the host to dial participants in. This can be a good option if you want to make certain everyone who needs to be on the teleconference is actually present (special conditions apply to this service – call us to find out how it works). 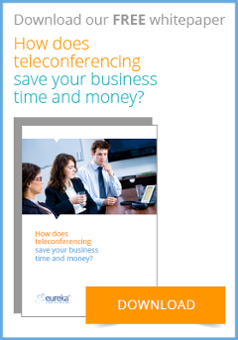 Want to learn about how teleconferencing can help you save your business time, money and the environment? Read our new whitepaper today to start saving!